Exquisite Tahitian Black Pearl and Diamonds Gemstone Satin Yellow Gold Cocktail Ring, from Sacchi's , hand-crafted with lost-wax casting technique. Lost-wax casting, one of the oldest techniques for creating jewelry, forms the basis of Sacchi's jewelry production. Modelling wax in the round allows to sculpt small and large pieces, and polishing with agate stones gives characteristic light effects. The Ring is comprised of 18 Karat Yellow Gold Satin Finish, set with a Tahitian Black Pearl Gemstone in the center and embellished with two White Round Diamonds. Sacchi's Jewels are entirely handmade by master craftsmen in our goldsmith workshop located in the center of Rome. Handmade in Italy (Rome). Diamonds: N°2 White Round Diamonds (Total weight 0.02 Carat) Pearl: Tahitian Saltwater Black Pearl (Diameter is 8.5 mm approx.) Size: Free resize, please contact us. 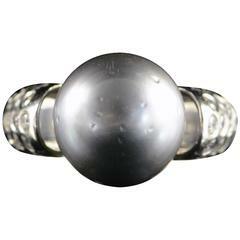 Large Tahitian pearl cocktail ring with diamond accents crafted in 18 white gold. Size 7. Signed T & S. Diamond total carat weight, 1.5 carat. Pearl, 13mm. Height from finger, 14mm.